सुल्तानपुर: उत्‍तर प्रदेश में केंद्रीय मंत्री मेनका गांधी इस बार सुल्‍तानपुर से चुनाव लड़ रही हैं. उनके बेटे वरुण गांधी उनकी सीट पीलीभीत से मैदान में हैं. आम तौर पर राजनीति में गांधी परिवार के लोग एक दूसरे पर छींटाकशी नहीं करते. लेकिन इन चुनावों में माहौल दूसरा है. 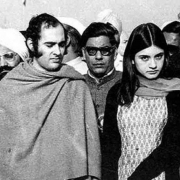 केंद्रीय मंत्री मेनका गांधी इस बार राहुल गांधी और प्र‍ियंका गांधी के सवाल पर न सिर्फ चुप्‍पी तोड़ रही हैं, बल्‍क‍ि उन पर निशाना भी साध रही हैं. 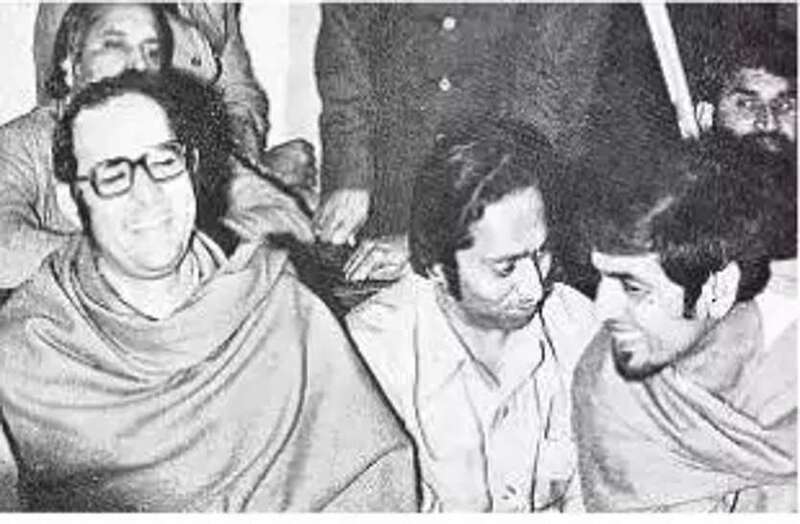 वह तो यहां तक कह चुकी हैं कि अगर बीजेपी उनसे कहेगी तो वह अमेठी में चुनाव प्रचार भी करेंगी. 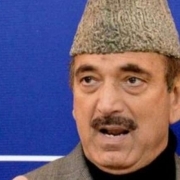 सुल्‍तानपुर में चुनाव प्रचार के दौरान मेनका गांधी ने रविवार को राहुल गांधी के दो जगहों से चुनाव लड़ने के सवाल पर जवाब दिया. उन्‍होंने अपने चुनाव प्रचार के दूसरे दिन कांग्रेस अध्‍यक्ष राहुल गांधी और प्रियंका गांधी वाड्रा पर वार करते हुए कहा की यदि प्रियंका बनारस से चुनाव लड़ती है तो उनके जीतने की गुंजाइश शून्य है. 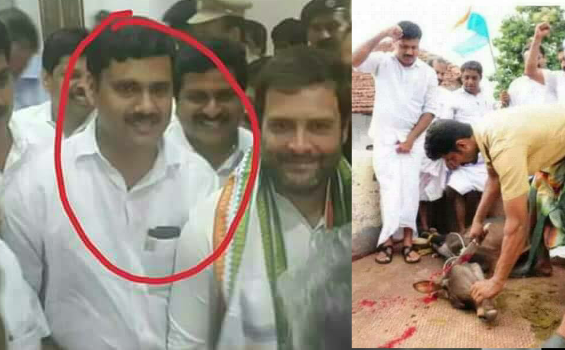 मेनका गांधी ने कहा, राहुल गांधी अपनी दोनों सीटें गंवा देंगे. 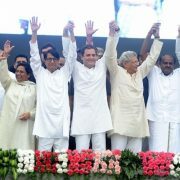 उन्‍होंने राहुल के अमेठी के साथ केरल से चुनाव लड़ने के सवाल पर कहा की बीजेपी दोनों सीटे जीतेगी. 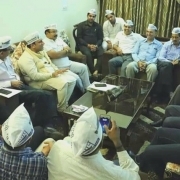 केरल की वायनाड सीट पर बीजेपी चुनाव नहीं लड़ रही है. यहां पर उसकी सहयोगी पार्टी चुनावी मैदान में है. मेनका ने रविवार को सुल्तानपुर के प्रसिद्ध मंदिर विजेथुआ महाबीरन के दर्शन करने के बाद अपने चुनावी कार्यक्रम में लोगों को सम्बोधित करते हुए कहा की सुल्तानपुर में इस बार यहाँ चुनाव की लड़ाई तो है ही साथ ही एक और लड़ाई भी है जो है कौरव और पांडव की लड़ाई है. एक तरफ ऐेसे नेता हैं जो शरीफ हैं. ईमानदार हैं. लोगों की सेवा करने निकले हैं और दूसरी तरफ ऐसे लोग हैं, जो बंदूख की नोक पर हर काम करते हैं. जब हम लोग वोट देते हैं किसी बंदूख वाले को तो हम अपने बच्चों नौजवानों को खतरे में डालते हैं. उन्होंने कहा कि मै एक मां हूं. आप सब मेरे बेटे हैं चाहे वो वरुण हो या राजेश हो. मेरे बेटे ने भी यहां के लिए बहुत काम किया है और मै भी काम करना चाहती हूं मेनका ने महिलाओं के दिल पर छाने के लिए कड़ी धूप में भी लगभग 500 मीटर तक पैदल चलकर कादीपुर चौराहे पर लगी सरदार बल्लभ भाई पटेल की मूर्ति पर पुष्प चढ़ाए. A one day seminar on Law, Technology and Development in the 21 st Century: Transforming Challenges Into opportunities, sponsored by Indian Council for Social Sciences Research North West Regional Centre (ICSSR-NWRC) was held at University Institute of Legal Studies, Panjab University, Chandigarh, on 30 th March 2019. The seminar, held under the mentorship of Professor Rattan Singh, Director, University Institute of Legal Studies and Dr. Sabina Salim, Faculty Co-ordinator, discussed the fundamental issue of the 21 st century i.e. relationship between technology and law. In the keynote address Professor Sanjay Sindhu, Director University Institute Legal Studies, Himachal Pradesh University, Shimla highlighted the complexities between technological advancements and development of law. With a special emphasis on the Indian position, the necessity of law to keep abreast with technological advancements as well as the need to evaluate the manner in which technology affects the field of law was analyzed in greater detail. Further, he referred to the intricacies of technologies and its effects on the society while playing in the cyber world and laws related to technology. He also pointed out the way in which the development and society have to maintain balance with each other. Discussing multiple dimensions in the technological shift, he emphasized on the need for field of law to keep pace with the changing times in order to cater to the society at large. Refering to the 21st century as a century of dynamic changes, professor Sindhu reiterated that law required to be dynamic to cater to the present challenges. Citing examples from the law, the thought provoking address focused on many socio-political and cultural challenges which the society would face with the advancement of technology Distinguished members from the field law were a part of the seminar. The chief guest on the occasion was Mr. Partap Singh, Sr. Advocate and Member Bar Council of India. The guest of honour included Mr. Harpreet Singh Brar, Chairman, Bar Council of Punjab and Haryana High Court and Mr. Suvir Sidhu, Honrary Secretary, Bar Council of Punjab and Haryana High Court. Mr. Partap Singh praising the research work carried in the region, highlighted the importance of such seminars as they create a bridge between the world of praxis and theory, and help in formulation of syllabus which address the needs of the society. Further, the rapid development in technology and the need for of law to cater to such challenges were discussed by the dignitaries. In addition, Professor Rattan Singh highlighted the importance of contemporary topics as a subject of discussion for the seminars. His address focused on the challenges faced by law with technological advancements highlighting advantages and challenges. With more than one hundred paper presentation from all over the country, the participants comprehensively discussedsocial, political and cultural issues around the complex subject which was further divided intofour sub-themes which included Economy, Technology and Development, Society, Cultures and Technology, Environment, Technology and Development and Technological Challenges and opportunities: The Future of Law. 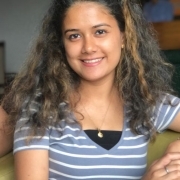 Tanvi Samujh, an intern of Dr Harvans Singh Judge Institute of Dental Sciences and Hospital, Panjab University, Chandigarh attended the 3rd Euroscicon Conference on Dental & Dental Hygiene at Budapest (Hungary) from March 25-26,2019. She was awarded the Best Paper Award in the meeting for her paper entitled ”Autotransplantation: An evolving treatment modality in modern dentistry patients.” Autotransplantation is a new technique which provide patients with all the benefits of a natural teeth. This technique involves the transfer of impacted, embedded, or, erupted teeth into extraction sites or into surgically prepared sockets. She has also moderated one full day scientific session on March 25,2019. Tanvi gives the credit of this honour to her College Principal Dr. Jagat Bhushan for his continuous encouragement and support, to her teachers who helped her to prepare the paper. Tanvi has all the praise for her parents who constantly motivated her to attend the international and national conferences. Her father Dr. Ram Samujh is working as Professor and Head, Department of Pediatric Surgery at Postgraduate Institute of Medical Education and Research (PGIMER), Chandigarh. 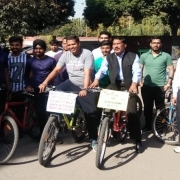 Residents of Boys Hostel 1, Mehr Chand Mahajan Hall, Panjab University, organized a cycle rally today dated 31 March, 2019, which started at 8 A.M from the hostel premises to other hostels of PU Campus. The theme of cycle rally is “Green Campus, go green on cycles”. Prof. Emanuel Nahar, Dean Student Welfare, flagged off the rally, Prof. Narinder Singh from IIT, Ropar, Punjab, address the gathering about healthy life and how cycling helps to reduce stress. Dr. Rajeev Kumar, Warden, BH1, presented vote of thanks to all the participants especially Kuldeep Singh and Bunty Sharma Ph.D who took imitative to start this event. (Vocal and Instrumental) and Dance for the term 01.04.2019 to 31.03.2021. POSTGRADUATE BOARD OF STUDIES IN COMMERCE for the term 1.4.2019 to 31.3.2021. Studies In Psychology for the term 1.4.2019 to 31.3.2021. 4. Dr. Rohini Thapar, Ph.D.
3. Shri Kuldeep Kumar, M.Phil. 1. Shri Lalit Mohan Garg, M.Sc. Professor Raj Kumar, Vice-Chancellor, Panjab University held a meeting with Sh Maninder Singh, Principal Secretary, Govt. of Assam, here today at PU. Assam Government has offered Shrimanta Sankardeva Chair to Panjab University.It was discussed to link Research of various saints during Bhakti movement with the teaching of Shrimanta Sankardeva. Digitization of sculptures/literature related to Shrimanta Sankardeva and spreading its messages through social media and technology was also considered. In the field of Bio-Technology, mutual collaboration for translating the same into economic benefits through its application in the development of products, processes and services exploiting the rich flora and fauna of Assam entailing field of agriculture, fisheries, healthcare, animal studies, energy and environment was discussed in details. Transfer of Enabling technologies pan India industry by collaborative research projects, Hand holdings, Twining arrangements, students internships and Faculty exchanges were discussed. Hotel and Management Department is to explore exchange ways of preparation of local Cuisines. In the field of Dental Science, it was felt thatDental education and health state of Assam is not as advance as in Chandigarh. PU has been providing a good platform to achieve that through its Dental Institute. So a collaborative initative can be planned where in expertise of PU Dental institute can be utilized to propagate dental education in Assam. Another area of this arrangement can be outreach in the form of facilitation of dental health provision in remote and difficult to reach areas. Existing model of dental treatment of needy population at their respective places can be replicated/ referred in AssamEngineering. Also, exchange programme for Assam Dental students can be organized to give them the opportunity to use facilities of Dental College. Such exposures will benefit the state of Assam in the long run. It was also deliberated that educational and practice workshops on Artificial Intelligence, Machine Learning, Cyber Security, BioMedical, IoT, Telecommunication etc. be organized for faculty/ students of various technical institutions in Assam. Tejpur University can also be involved in the initiatives. It was discussed to prepare collaborative research projects along with Assam researchers and be executed. A meeting with Director, Technical Education can be fixed to explore the collaborations. Possibility of providing internship to UIET students in Assam Government departments and vice-versa for cultural exchange to be explored in addition to possibility of providing internship to Chemical Engineering students in Petroleum Industry. The department is already mentoring Engineering Institute in Dibrugarh under TEQIP-III programme. • Students of various courses of Panjab University go for two/six month internship programme in various corporate, Government funded projects, Government institutions etc. They can be offered these internships in various Assam Government or Government funded projects. • Similarly, students from Assam Universities and institutes can also offered such internship/training programmes in various government funded projects in different University departments during the months of June-July every year. In the field of Languages, collaboration with EFLU, PU can offer the English Proficiency Course to students and citizens of Assam. This course involves twenty hours of face to face teaching and one year of online instruction and interaction. The Department of English and Cultural Studies can tie up with North East Universities for research in Cultural Studies on Assam-Specific topics and topics relating to Sikh Culture and History of Assam. The meeting discussed regarding Internship in all the fields, especially in Engineering, Science, Dental, development of curriculum as per the changing times and collaborative research. 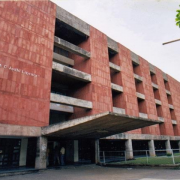 A meeting of the Vice-Chancellor, Directors of institutions of Assam will be planned with the Vice-Chancellor Panjab University and other officials after completion of general election process to carry the collaborations forward. Those present from PU included Professor Shankarji Jha, Dean University Instruction, Professor Devinder Mehta, Dean Sciences,Professor Deepti Gupta, Dean Alumni, Professor Nandita Singh, Dean International Students, Professor Jagat Bhushan, Director-Principal, Dental Institute, Professor Meena Sharma, Director, Placement Cell, Professor Savita Gupta, Director, UIET, Professor Sanjiv Puri, Director, CIIPP, Professor Harish Kumar, Director, Skill Development and Professor Ashwani Kaul, Department of Bio-Physics. In continuation of a special drive against consuming liquor at public place, yesterday, the drive was carried out at different parts of the city. Under this drive total 05 different cases U/S 68-1(B) Punjab Police Act 2007 & 510 IPC got registered in different police stations of Chandigarh in which total 06 persons were arrested while consuming liquor at public place. All later on bailed out. The detail of police Stations in which cases U/S 68-1 (B) Punjab Police Act 2007 & 510 got registered:-PS-17 = 1 case, PS-I.T Park = 1 case, PS-39 = 3 cases. 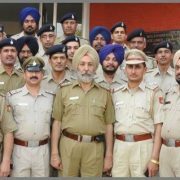 Chandigarh Police arrested Paras R/o # 672, Colony No. 4, Indst. Area, Chandigarh from near light point, EWS Colony, Part-2, Mauli Jagran, Chandigarh while illegally possessing 25 bottles of country made liquor on 30.03.2019. A case FIR No. 54, U/S 61-1-14 Excise Act has been registered in PS-Mauli Jagran, Chandigarh. Investigation of the case is in progress. A case FIR No. 29 U/s 61-1-14 Excise Act has been registered in PS- 49, Chandigarh on the complaint of HC. Gurnam Singh, Traffic Staff against two persons namely Pardeep Kumar R/o village- Mugher, P.O- Boda, Tehsil- Palampur, Distt.- Kangra, Himachal Pradesh and Mohinder Pal R/o # 5271, MHC, Manimajra, Chandigarh while illegally possessing 90 boxes (1,080 bottles) of English wine and 70 boxes (840 bottles) of beer loading in Tata Ace No. CH-01TB-7931 from near Sector- 44/51 light point, Chandigarh on 30.03.2019. Both accused have been arrested in this case. Investigation of the case is in progress. Chandigarh Police arrested Deepak R/o # 2544, NIC, Manimajra, Chandigarh while he was gambling at Fish market, Shastri Nagar, Manimajra, Chandigargh on 30.03.2019. Total cash Rs. 1,130/- was recovered from his possession. In this regard, a case FIR No. 71, U/S 13A-3-67 Gambling Act has been registered in PS-I.T Park, Chandigarh. Investigation of the case is in progress. Rahul Sharma R/o SCF No. 36, Grain Market, Sector-26, Chandigarh, Permanent Address- Village- Mannani, P.O- Muara Pranimia, Tehsil- Akhnoor, Distt.- Jammu reported that unknown person robbed away complainant’s cash Rs. 700/-, Driving License and Aadhar Card at knife point near SCF No. 01, Grain Market, Sector-26, Chandigarh on 30.03.2019. A case FIR No. 72, U/S 392 IPC has been registered in PS-26, Chandigarh. Later on 01 accused person namely Arun R/o # 314, NIC, Manimajra, Chandigarh has been arrested in this case. Investigation of the case is in progress. Guru Sami R/o # 3971/A, Mauli Jagran Complex, Chandigarh reported that 02 unknown persons occupant of activa scooter tried to robbed complainant’s at knife point near his residence on 30.03.2019. Out of 02 persons 01 accused person namely Viney R/o # 1301, Rajiv Colony, Sector-17, Distt.- Panchkula, Haryana caught by complainant and his brother on the spot. A case FIR No. 55, U/S 398 IPC has been registered in PS-Mauli Jagran, Chandigarh. Activa scooter No. HR-03X-6389 has also taken into Police Possession. Investigation of the case is in progress. Varinder Kumar R/o # 620, Harmilap Nagar, Baltana, Distt. Mohali, Punjab reported that unknown person stolen away complainant’s Motor cycle No. CH-01AB-1893 while parked backside of Booth No. 1086, Sector-22/B, Chandigarh on 23-03-2019. A case FIR No. 92, U/S 379 IPC has been registered in PS-17, Chandigarh. Investigation of the case is in progress. Sumit R/o # 2150, Sector-41/C, Chandigarh reported that unknown person stolen away complainant’s motor cycle No. HR-08Q-2163 while parked near his residence on night intervening dated 28/29-03-2019. A case FIR No. 79, U/S 379 IPC has been registered in PS-39, Chandigarh. Investigation of the case is in progress. Abhinav Jassal R/o # 1030, Sector-21/B, Chandigarh reported that unknown person stolen away stolen away Copper pipes of AC from roof top of complainant’s residence in between 26.03.2019 to 29.03.2019. A case FIR No. 90, U/S 379 IPC has been registered in PS-19, Chandigarh. Investigation of the case is in progress. A case FIR No. 80, U/S 323, 506 IPC has been registered in PS-39, Chandigarh on the complaint of Jorawar Singh R/o # 648/1, Sector-41/A, Chandigarhwho alleged that Vishal and Lavish beaten/threatened complainant near # 712, Sector- 41, Chandigarh on 14.03.2019. Complainant’s got injured and taken to GH-16, Chandigarh. Investigation of the case is in progress.